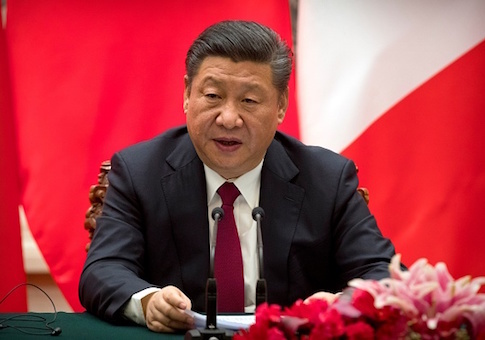 European leaders who last year hailed Xi Jinping as a defender of the global trade system are changing their tune as the Chinese president continues to exert control domestically and internationally. In Xi's latest consolidation of power, China's ruling Communist Party announced last Sunday that it will abolish the two-term limit for presidents, allowing him to continue serving potentially for life. European leaders now think Xi may be more of a threat than they realized, the New York Times reported. Last year, many Europeans were thrilled that the secretary general of China's Communist Party seemingly took up the mantle to defend the global order during the World Economic Forum in Davos, Switzerland. But German Foreign Minister Sigmar Gabriel last month accused China of pursuing its own form of world order and trying "to put a Chinese stamp on the world and impose a Chinese system, a real global system but not like ours, based on human rights and individual liberties." "If we don't succeed in developing a single strategy toward China, then China will succeed in dividing Europe," Gabriel said in an earlier speech. Many other Europeans have come around to Gabriel's critical position on China, as Xi's "One Belt, One Road" infrastructure project across Eurasia has European elites worried about the prospect of China gaining trade routes to 16 European countries. The infrastructure plan could leave several countries around the world in debt to China. François Godement, a China scholar at Sciences Po in Paris, said China's rivalry with democracies is "increasingly frank." "I don't know who is still fooling themselves about convergence and liberalization—Xi put an end to that long ago," Godement said. "Official China has been increasingly frank about a systematic competition with democracies." China maintains that it is a fair player in the modern economy, even as Beijing has far more trade restrictions than most Western countries. In response to President Donald Trump's recent decision to impose tariffs on imported steel and aluminum, Chinese premier Li Keqiang touted China's "game-changing" economic reforms. "Reform and opening was a game-changing move in making China what it is today," Li said, adding that China is developing a "great modern socialist country." "We must go further in freeing our minds, in deepening reform, and in opening up," he said. "We need to give full play to the pioneering drive of the people and encourage all localities, based on their own conditions, to dare to explore, dare to try things out and dare to confront the toughest of issues." Experts on China's economic activity told the Washington Post that Li's comments were deceptive. Christopher Balding, an associate professor at the HSBC Business School in Shenzhen, noted that China has learned that touting its own economic liberalism may be dishonest, but it works. "They've said the same thing for the past five years, so it's difficult to take it seriously," Balding said. "But what they seem to have learned is that if you say the rhetoric, it gets people's attention, even if it is fundamentally untrue." Balding said China is trying to claim the high ground of free trade in light of Trump's newly unveiled tariffs, even though "the reality is very different." German concerns about China's trading practices have heated up recently, as the Chinese car company Geely purchased a 10 percent ownership stake in iconic car manufacturer Daimler. Where that money came from has been a subject of debate. "It's a highly public discussion about Chinese influence in Germany," said Angela Stanzel of the European Council on Foreign Relations. "There have been 10 times as many articles about Daimler than about Xi prolonging his rule." This entry was posted in National Security and tagged China, Economy, Xi Jinping. Bookmark the permalink.